These beauties are very easy to make. They have little use other than contemplation but I definitively won’t complain! 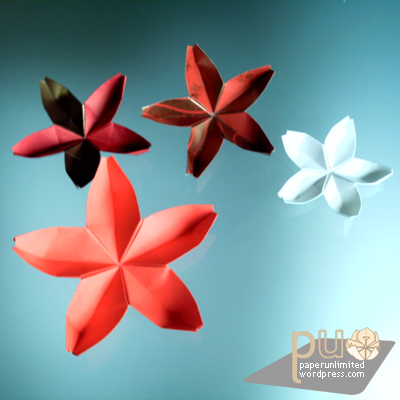 :) The white one was made from 4×4 cm and the bigger, red, one from 7 cm square paper (approximately 1.6 and 2.8 inches). For me as usual the tiniest the cuter they are! :D Another note: the author of these flowers also made the somehow famous sakuradama (not in this book, though) so these are a good start for the sakuradama since the joining method is the same and there are similar folding steps. This entry was posted on 2007|06|17 at 13:32 and is filed under modular origami, origami. You can follow any responses to this entry through the RSS 2.0 feed. You can leave a response, or trackback from your own site.